New motorcycles are always highly anticipated, especially the ones for enthusiasts, as they are always on the lookout for a new experience. Few motorcycles launched in the country in recent times would have been as highly anticipated as the Royal Enfield the Himalayan though. It is, after all, the first purpose built adventure touring motorcycle from the brand, not to mention, the first all-new product with a brand new engine and platform in the longest time. The brand needs no introduction to anyone who rides a motorcycle in the country perhaps – its classic looking bikes enjoy a cult popularity like few others do, especially for the experience of riding one and also the characteristic thump. In effect, the Himalayan is a radical departure for the brand from its ethos. But at the same time, touring on a motorcycle and Royal Enfield are usually said in the same breath. Each year thousands of bikers flock to the Himalayas, mostly on a Royal Enfield in search of the solace that we all look for on a motorcycle. The Himalayan does makes a lot of sense in that regards and Royal Enfield invited us to the very land that the bike gets its name from – the mighty Himalayas – to experience the bike. Here’s what we think of what is India’s first purpose built adventure tourer. We’ve all seen the Himalayan at its official unveil before the 2016 Auto Expo, and I don't need to tell you about Royal Enfield’s minimalistic approach in terms of the design – the round headlight with the tall windscreen and round mirrors look slightly dated, but I guess the brand didn’t really want to move away from the traditional looks of its motorcycles which works well. The knee recesses on the fuel tank are great to use, and let you grip the tank nicely when braking. The tank could have been wider though, since the panel below the rider’s seat which has the Himalayan name on it in a large font is wider than the tank itself, and that makes it a bit difficult to grip the tank with the insides of your knees when standing up and riding – and that’s something you do a lot on long rides or off tarmac. The seat is nicely scooped for the rider and is very comfortable – I was almost surprised at how comfortable I was in the saddle even after 3-4 hours of continuous riding. The Himalayan is accesible to shorter riders thanks to a low seat height of 800mm, keeping in mind the average height of Indian riders. We didn’t have panniers on our test bikes, but the mounts for them are a well-executed job, and so are the mounts for the jerry cans on both sides of the fuel tank. The LED tail light does its job well while looking nice, and sits under a large metal grab rail that also doubles up as a mount for a tail bag. A 21-inch front wheel and a 17-inch rear give the side profile of the bike a likeable appearance, in conjunction with the tall handlebar, though I would have liked it to be mounted about half an inch higher for better manoeuvrability, especially when standing up. The upswept exhaust looks nice and works well in not letting water get in, as I discovered while crossing a rivulet. Functional, well-executed design on the whole. In terms of features and equipment, the bike gets all you could ask for apart from the obvious speedometer tachometer and fuel gauge, including a digital gear indicator, two trip meters, average speed display, side-stand indicator, clock, temperature gauge and a compass as well! I wish a 12V socket would have been offered as well, which would allow charging of cell phones and GPS units on the go. The Himalayan gets a 14-litre fuel tank. The brand claims a range of 400 to 500km on a tank full, which sounds good for distance riding. Royal Enfield also told us it would have been easy for them to go in for a larger tank and thus offer better range, but that would have made the bike top heavy and cumbersome to ride each time the tank was filled to its brim. Perhaps the section most bikers would be interested in knowing about, even more than the bike’s abilities. The good news is, the all-new, air-cooled, 411cc single-cylinder engine feels very refined, even close to its 6,500rpm, and has a torquey feel to it. With a relatively healthy 32Nm on offer, that isn’t surprising. It is the first RE motor to employ oil-cooling. But what I and a lot of other journos on the ride felt was that the engine could have been tuned for some more performance. 24.8PS of power is slightly underwhelming for a motorcycle like the Himalayan. A candid chat with Siddhartha Lal, MD and CEO of Eicher Motors, who also rode with us, justified the output though – the primary target audience for the bike is someone upgrading from say, a 150cc bike. The idea was to keep the power output such that even relatively inexperienced riders can harness all of it, apart from ensuring fuel efficiency figures are good enough for someone to want to buy the Himalayan as his daily ride as well. While I cannot deny the justification, there were several occasions when a lot of us felt an additional 5PS would have made it more fun to ride. I would have also liked the throttle response to be a bit crisper as well. Climbing up inclines or even something as basic as accelerating from standstill would thus be more fun and quicker. And that’s something I’m certain tuners around the country will be able to do. The highlight of the engine though is the refinement, and given the amount of testing done on the bike, I am pretty convinced about the engine’s reliability as well. The good thing is fuelling on the bike is via a carburettor, which also get a throttle position sensor, which means you can get the bike fixed even in the remotest of areas. If you are expecting the Himalayan to have a thump like the other Enfields, you will be in for a disappointment, but I personally liked the exhaust note, and felt it suits the bike’s character well. Kudos to the Royal Enfield team for the work done on the new powerplant. The 5-speed gearbox boasts adequate ratios for varied terrain as well, though the shifts could have been slicker I felt. Another important highlight of the Himalayan is its rear monoshock, a first for a Royal Enfield. The way it performs its duty is commendable, in terms of aiding the handling and offer a plush ride as well, offering 180mm of travel. The Himalayan is meant to ply on all sorts of terrain – super smooth tarmac, dirt, broken roads, non-existent roads and what not. The suspension has been tuned beautifully to do it all, and I was pleasantly surprised at the plushness of the ride quality offered by the 41mm front forks (200mm travel) in conjunction with the monoshock on every possible terrain we rode on, and it included all of the aforementioned conditions. Goes without saying, the boffins at Royal Enfield have tested the suspension and perfected its setup after clocking thousands of miles on every possible terrain which shows as soon as you take the motorcycle off tarmac. Coming to handling, I can safely say, the Himalayan is the best handling bike from Royal Enfield. After a day in its saddle on some of the worst terrains like slush, dirt, broken roads and even snow has me convinced. Due credit goes to the well-sorted chassis, developed by the folks at Harris in the UK. The well-perfected suspension setup and the dual purpose tyres from Ceat further add to the fun element. The tyres worked brilliantly where we rode the bike, and there was nary a moment when I felt unsure of what either end of the bike was doing. The bike also feels extremely flickable from one side to the other, and feels light, nimble and surefooted like a mountain goat. The brakes worked well too, especially the front, providing ample confidence to grab a handful of the front brake lever irrespective of the terrain I was on, wet tarmac in pouring rain included. The rear brake could have offered some more feel, though I liked the way it allowed me to lock the rear tyre and have the rear step out while entering corner, to make quick directional changes. The bottom line is the fact that Royal Enfield wanted to offer a motorcycle to enthusiasts that would give them the confidence to go anywhere, and the bike has been tested extensively in the Himalayas, on highways and even by CS Santosh, India’s only Dakar competitor and returnee. And the Himalayan is a job well-executed to that effect. The Himalayan is one of those motorcycles that are designed for a specific purpose. And Royal Enfield has ensured the bike does that, by perfecting every element on the motorcycle, and leaving almost no room for error. 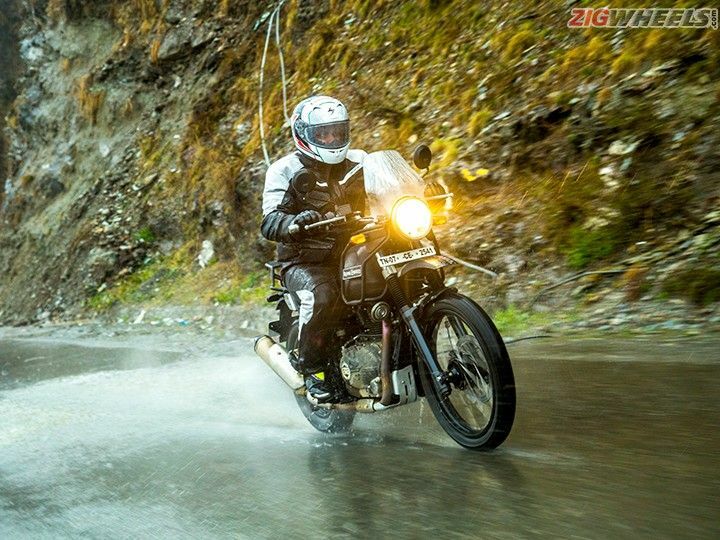 I am someone who has been raised on a healthy diet of motorcycles oriented towards riding on tarmac, and that said, the Himalayan has impressed me to a great extent with its capabilities and the confidence it inspired to open the throttle wide, be it in pouring rain, on non-existent roads or even on snow. As Siddhartha Lal put it, the Himalayan is what Royal Enfield is all about – the holistic experience of riding a motorcycle. With adventure touring on motorcycles gaining popularity in the country rapidly, we have yearned for a purpose built motorcycle that does not cost you a bomb. The Himalayan is a simple motorcycle that knows its job well and goes about doing it with aplomb. The bike has been launched on March 16, and is priced at Rs 1.78 lakh on-road, Mumbai. That should be a perfect price point for the motorcycle, as that should make it accessible to an array of motorcyclists. To sum it up, this is a motorcycle that has been built for enthusiasts, by enthusiasts, and Siddhartha Lal’s involvement and contribution to the bike’s development is a great portrayal of his passion for motorcycles. Royal Enfield had an advertisement years back with a caption that said ‘Leave home’. I think the brand should revive it for the Himalayan, since the bike will certainly want you to go out and explore the world, on two wheels.